Pictured from left: Marshall County Special Olympians Jayden Antill, Bryan Belford, Elizabeth Schlieper and Kaylee Schlieper. 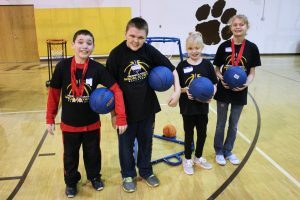 More than 140 Marshall County Special Olympians participated at the county’s 3rd annual basketball competition on Wednesday in John Marshall High School’s gymnasium. Students from all Marshall County elementary, middle and high schools hit the hardwood along with a few graduates to compete in dribbling, shooting and passing events. More than 80 peer tutors from both Cameron High School and John Marshall High School assisted the athletes while shooting hoops. Knights of Pythias and American Legion members handed out medals and also donated money to help fund the Winter Games. Special Olympians will compete again in the spring at the Marshall County Special Olympics Track and Field event on Thursday, April 26, 2018 at the John Marshall High School Soccer Field in Glen Dale.